In the premium edition of The 5 Minute WrapUp on 11 November, Rahul Shah wrote about the reasons why India is a cash based economy. Trust in online payments, security risks, identity and privacy issues, as well as old habits of paying in cash, are just some of things that he mentioned. The bottomline is that it'll take a long time for India to even come close to a cashless economy. Many nations are way ahead of us. As today chart shows, India trails many developing as well as developed economies (except Japan) when it comes to the use of cash. While some of it will surely be black money, India's informal economy is a vital cog in economic growth. 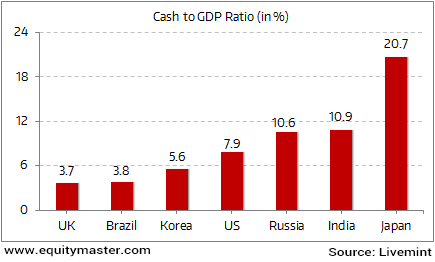 As per an article on Livemint, the Indian economy's dependence on cash could worsen. Low balances in most Jan Dhan Yojana accounts point to the fact that people in rural India have not got in to the habit of depositing their hard-earned cash savings in banks. Sadly, they are likely to bear the brunt of the demonetisation drive.